Stories say that when the Macintosh was complete, there was a big party at Steve Jobs' place. He made the team that worked on the machine sign a piece of paper. The piece of paper became the model for a metal plate that would go inside every Macintosh computer. It's kind of a strange thing to sign the inside of a computer, especially one that was not really user-serviceable. For Jobs, the original Macintosh was not just a computer; it was a piece of art. It was the first mainstream computer to have a graphical user interface, and the team had employed a number of people who had artistic qualities as well as technical ones. As all great artists sign their work, Jobs thought, so should the Mac team sign the piece of art computer they had made. In the tradition of artists throughout history, those proud iconoclasts at Apple who created the original Macintosh signed their creations for posterity. 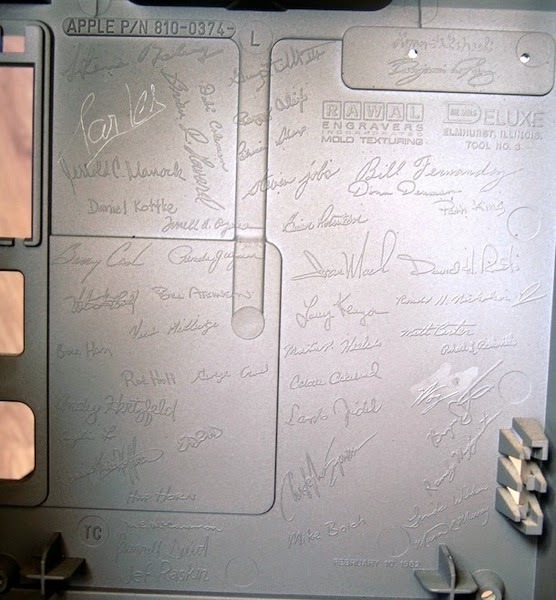 Inscribed into the inside rear panel case mold for the 128k, 512k and Mac Plus are the signatures of Steven Jobs, Bill Atkinson, Andy Hertzfeld, Bruce Horn, Jef Raskin and the rest of the historic team. The whole story is at Andy Hertzfeld’s blog Folklore, which tells the story of the creation of the Macintosh via recollections from the original participants.